Two sections of the path alongside the River Avon are due to be closed for extensive periods. The first is an 18 month closure of the Pill Path while the Portishead branch line is upgraded for passenger train services, but this doesn’t start until 2020. The second is a section of the River Avon Footpath Path by Cattle Market Road and the new Arena site. This is closed from now until Autumn 2018 while the new St Philips footbridge is built (see picture and visit BristolTempleQuarter for more information). We got quite excited when opening the email about the Pill Path that this was going to include some long awaited upgrades to Pill Path (see Andy Price’s excellent video Avon Gorge Cyclepath – a neglected jewel). Sadly not (but see update below). There will be some beneficial changes at either end associated with new stations, but no changes to the tow path itself. Full details are not yet available, but “closures are likely to be for a few hours of a day at a time, and a few days at a time where necessary”. During closures there will be a long detour up through Ashton Park Estate, along the A369 then down through Leigh Woods. 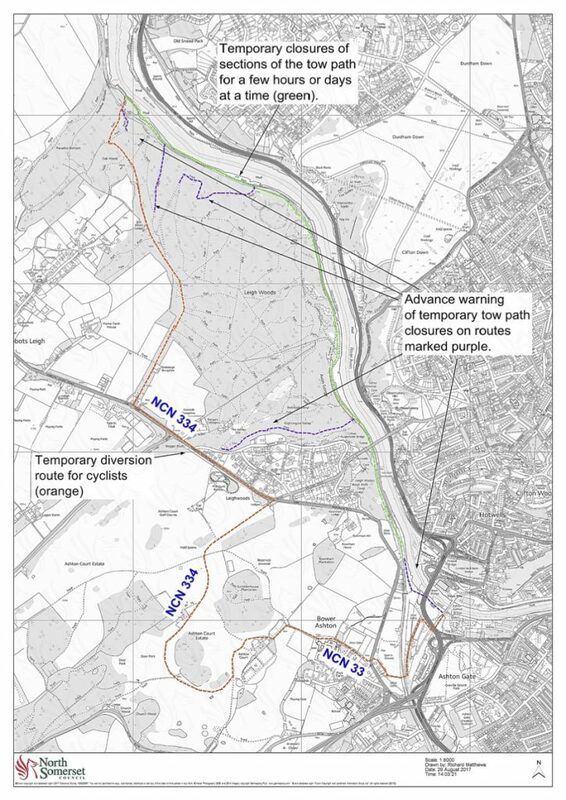 Our proposals to make temporary and permanent changes to the cycle network, as a part of the MetroWest Phase 1 scheme. Most of the changes are within North Somerset, but we are making some adjustments in Bristol in the Ashton Gate area. The part of the MetroWest Phase 1 scheme that will require planning consent from the Secretary of State through a Development Consent Order (DCO), is the re-opening of the Portishead branch line to passenger train services. This includes a new station at Portishead and the reopening of the station at Pill. During the construction of the DCO scheme, it will be necessary to temporarily close and divert NCN 26, 41 and in other places to enable work to proceed safely and to create construction compounds and haul roads. These are set out in the attached map . There will also be a number of permanent changes and enhancements to the cycle network including the diversion of a public rights of way on to the AVTM maintenance path and the creation of a new shared-use ramp at Ashton Vale industrial estate. These changes are set out in Table 2 MetroWest Schedule of Cycle Network changes 17.08.23. There is a formal consultation on these proposals from 23 October 2017. The proposed railway works will provide some potential opportunities to improve the path. It may be needed for access to repair the retaining wall in the woods section. The path may need to be improved to do this, or repaired after the works – either way a repaired / improved path should be provided in mitigation. Also, the railway itself will be used to bring in 100’s / 1000’s of tonnes of stone, so it may be a way to bring in materials. BS to speak with our MetroWest colleagues. This is perhaps a once in a lifetime opportunity to really improve it.